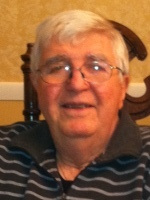 COLONIE – Patrick E. Renaghan, 79, of Colonie, passed away on Wednesday, July 22, 2015 at the Hospice Inn in St. Peter’s Hospital. Pat was born in Bayside, Queens, the son of the late Patrick F. Renaghan, and Helen R. McNamara Renaghan. He was raised in the Bronx and lived there until relocating his family to Roanoke, VA. The family then moved to Clifton Park where he resided for over 30 years. He and his wife recently moved to Colonie. He served in the U.S. Navy from 1955-1957 and was employed by Metropolitan Life Insurance for his entire career. Pat was a member of the Knights of Columbus, was an avid sports fan, and enjoyed participating in sports such as baseball, bowling and basketball. Pat was a devoted Yankees fan, and as a youth he worked for and was later recruited and attended tryouts with the Yankees. Throughout challenging times Pat maintained his positive attitude and dry sense of humor. Pat is survived by his beloved wife of 54 years, Rita J. DiDomenico Renaghan; his children Robert P. Renaghan (Cheryl D.) of Charlottesville, VA, Patricia A. Page (Thomas J.) of Wilton, Mike E. Renaghan of Latham, Kevin G. Renaghan of Albany, and Kathleen T. Westlake (Michael A.) of Auburn; his brother Robert B. Renaghan (Patricia A.) of Milford, MA; his sister in law Dolores M. Renz of Bayshore; his grandchildren Meghan R., Holly A., and Michael J. Page; and by several nieces and nephews. Funeral services will be held in the Hans Funeral Home, 1088 Western Ave., Albany, Tuesday morning at 8:30 am, and from there to the Historic Church of St. Mary on Capitol Hill, Pine & Lodge Streets, Albany, at 9:30 am. Relatives and friends are invited, and may call at the funeral home Monday from 3-7 pm. Interment will be in the Gerald B. H. Solomon Saratoga National Cemetery Tuesday at 12:00 pm. In lieu of flowers, contributions may be made to The Community Hospice for Hospice Inn, 295 Valley View Blvd, Rensselaer, NY 12144; or to the Leukemia & Lymphoma Society. To leave a message of condolence for the family or obtain directions to the funeral home, please visit www.HansFuneralHome.com. We are so sorry to hear about the passing of your father. You and your family are in our thoughts and prayers. Here in Roanoke, Va ,we are with you in loving prayers , sending our deepest condolences and will offer mass today July 25, 2015. Our daughter Pauline Donato Lea of Richmond, Va informed us of Patrick. E. Renaghan ‘s new eternal life. God Bless Always! Rita and family so very sorry for your loss. We had lots of fun through the yeas and Pat always amazed us with his sports statistics. We will always remember the good times. Pat is now at peace and his family was always there for him. Just remember the good times and Dad will always be in your hearts and thoughts. Rita and Family: Craig and I are so sorry on the loss of your husband, Pat. We were honored to know him and be a part of his life. He was a wonderful person. May God bless him and may he rest in peace. God bless all of you. With deepest sympathy. Wishing heartfelt condolences to the Renaghan Family in this time of sadness. Be strong, and keep a smile for him with the thoughts of the happiness you have had. Our thoughts, prayers and sincere condolences on your loss.